My featured award destination this month is Memphis, which appears on the hot lists of both American and United for the month of April. Memphis is the largest city in Tennessee. And into the 1950s, it boasted the world’s largest mule market. Of wider interest, perhaps, is the city’s rich musical legacy, spanning blues, country, and rock. The area was home to the likes of Elvis Presley, Muddy Waters, Carl Perkins, Johnny Cash, Robert Johnson, W.C. Handy, B.B. King, Howlin’ Wolf, Isaac Hayes, Booker T. Jones, and Al Green. After the White House, Graceland, the former home of rock legend Elvis Presley, is the most visited house in the U.S. Among the featured Elvis memorabilia are two of his private airplanes and his extensive automobile and motorcycle collection. Also worth a stop on any music lover’s pilgrimage is Sun Studio, where Johnny Cash, Rufus Thomas, Charlie Rich, Howlin’ Wolf, Roy Orbison, Carl Perkins, and Jerry Lee Lewis got their starts. It’s now a museum as well as a working recording studio. 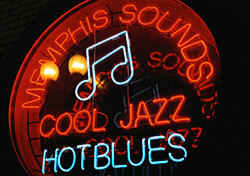 For live music, visit the bars and clubs of Beale Street, where B.B. King started his career. Next up: our neighbor to the north, Canada. American has seats to Montreal and Toronto. United is featuring Toronto, Winnipeg, Saskatoon, Ottawa, and Montreal. And US Airways invites you to book award trips to Edmonton, Montreal, Toronto, and Vancouver. Aruba, Bermuda, Grand Cayman, Montego Bay, Nassau, San Juan, and St. Thomas: Award seats to these and other Caribbean destinations are on offer from American, United, and US Airways. London is a perennial award favorite. United shows award seats on its flights to Heathrow, as does American. And US Airways has seats on its flights to Gatwick. While I’ve singled out London for special consideration, flights to many European destinations are open for award bookings. Although American is only highlighting its London flights, there are bonus-mile offers in place for Madrid and Moscow flights, suggesting that those routes are suffering from weak demand as well. US Airways shows availability on flights to Amsterdam, Milan, and Venice. And as mentioned several times previously, United is [% 2835063 | | discounting prices for award travel %] to Europe, lowering the cost down to 40,000 miles from the 55,000 miles normally required. The offer is in effect through May 14.